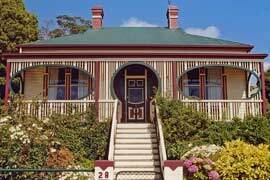 Boutique cottage accommodation in Burnie, Tasmania. 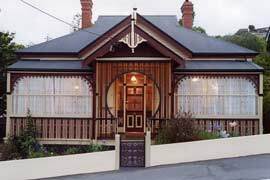 Burnie is only 1 hour 10 mins from Cradle Mountain and 50 mins from The Tarkine. Two great areas of Tasmania with diverse natural landscapes. The Duck House has won the hearts of all who’ve spent a night or two here amidst the luxurious surroundings, beautiful antiques and whimsical duck memorabilia. The Duck House cottage accommodates 5 people. “Mrs Philpotts” is a quite superb spacious three bedroom cottage with wonderfully warm and welcoming ambience. It accommodates up to six persons. Amelias is a fully self contained heritage house refurbished in the Queen Anne style featuring stained glass windows, fireplaces and a ball and clawfoot bath. Amelia’s Cottage can accommodate up to 6 guests in 3 bedrooms. As if the spacious, homely heritage building wasn’t enough we had some of the warmest, most welcoming hosts you could wish for. Warm welcome from the hosts. Kitchen is very well equipped. House is quirky, full of little secrets and ducks hiding everywhere. 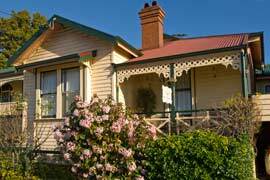 Book your boutique cottage accommodation now.